From the dramatic scenery to the world-famous beaches, friendly locals and delicious cuisine, Hawaii is a fantastic place to explore. 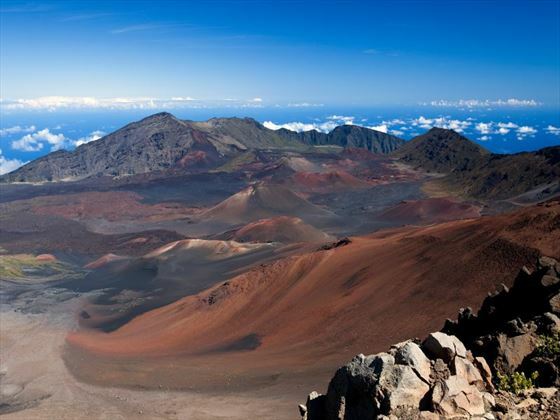 The Best of Hawaii escorted tour takes you on a ten-day adventure to some of this region’s best loved locations on the three beautiful islands of Ohau, Maui and Hawaii Island. 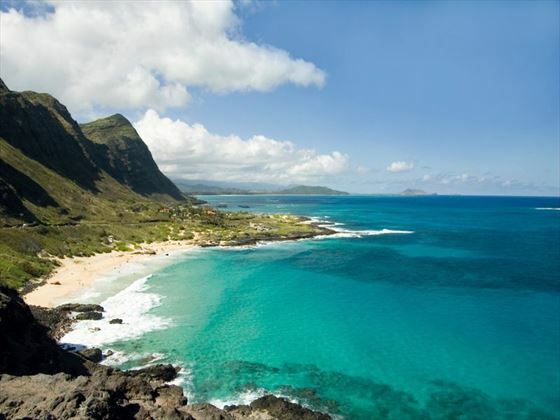 You’ll visit national parks, towering volcanoes, stunning golden coastlines and vast plantations to really immerse yourself in Hawaii and enjoy a glimpse into life here. 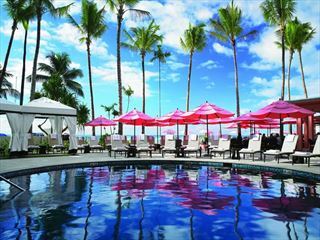 Accompanied by an expert guide, you’ll be treated to a host of fun and memorable experiences for a true taste of Hawaii. 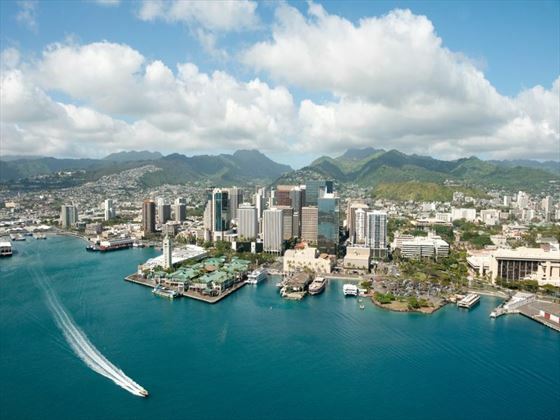 Arrive in Hawaii and check-in at your hotel in the heart of Waikiki Beach. The rest of the day can be spent at leisure, perhaps with a stroll along the beach, shopping or enjoying a tropical drink by the pool. In the evening, meet with your tour guide and group for a welcome reception. 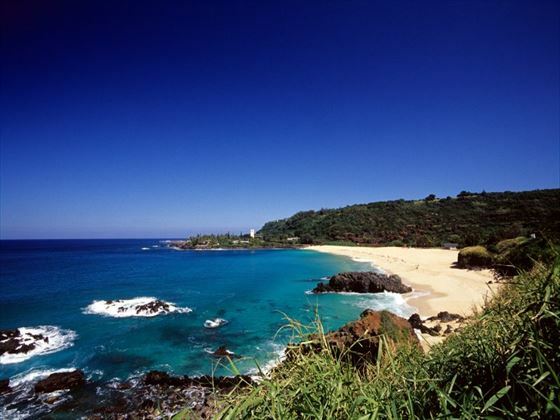 Travel across the island of Oahu today, traversing vibrant villages, rainforests and vast pineapple plantations. You’ll be treated to panoramic views of the ocean from points such as Pali Lookout, site of the historic Battle of Nuuanu in 1795. Take in the picturesque view of the North Shore (seasonal) then the evening is yours upon arrival back in Waikiki. Perhaps enjoy a Mai Tai cocktail as the sun goes down, and then sample one of the many restaurants in this fun resort. Today is a full day of free time for you to explore Honolulu, from the gorgeous beaches to spotting sea turtles and snorkelling at Hanauma Bay Nature Preserve. There are also a few optional activities available, including a submarine tour, a guided sightseeing excursion of the island’s picturesque East Coast or admiring the sunset on a wonderful evening cruise. In the evening, dine with your group at a local restaurant. Start today with a visit to Pearl Harbour and the USS Arizona Memorial, a moving tribute to the military personnel who tragically lost their lives in the 1941 attack which launched the U.S. into WWII. Drive through the National Memorial Cemetery of the Pacific, situated in Punchbowl Crater, before returning to downtown Honolulu to visit the Iolani Palace, the King Kamehameha I statue and the state capitol building. The remainder of the afternoon is yours to spend as you wish. Journey to the Big Island of Hawaii today via a short flight, enjoying an orientation tour upon arrival at the seaside village of Kailua-Kona. Afterwards, there will be time to explore the shops in the charming town. Visit a local coffee plantation with a local specialist who will give you a tour and explain the agricultural process of one of the island’s most famous crops. Later, check in at your hotel and try to catch a glimpse of the famous attraction of the property – the manta rays. Wake up to the sound of the rolling waves in one of the most beautiful locations in the world before embarking on a day of free time. 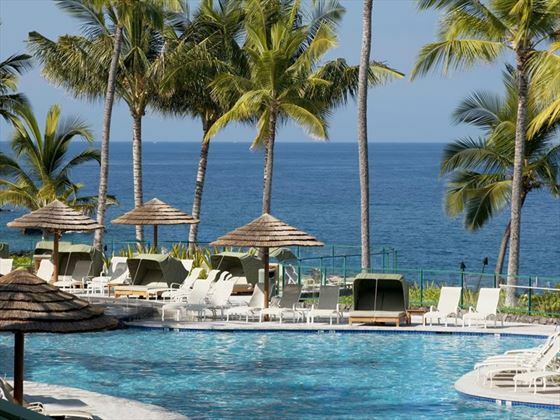 There are a host of optional excursions to make the most of it you would like to: take a snorkelling trip to see some of the multi-coloured marine life found in Hawaii’s waters, take a submarine ride to the coral reefs, take a helicopter flightseeing excursion over Big Island or simply relax by the pool at the resort. Visit the hotel’s Manta Ray Learning Centre for a presentation with a local guide on these majestic sea animals. In the evening, there is an optional activity to visit a historic working cattle ranch for dinner and entertainment. 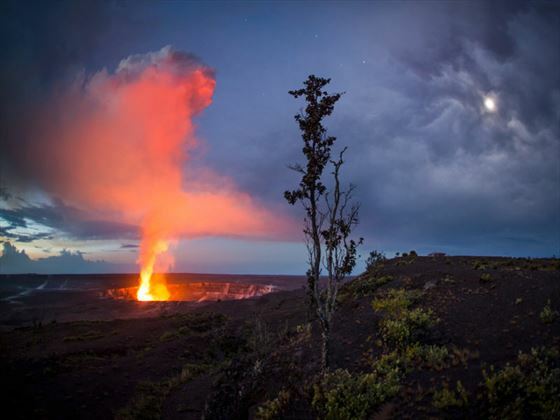 Say goodbye to Kona and head for the Hawaii Volcanoes National Park – a UNESCO World Heritage Site and home to the world’s largest and most active volcano. Along the way, you’ll witness the long stretches of black sand beaches the island is famous for, as well as enjoying time to stop at the southernmost bakery in the U.S. Enjoy lunch at The Rim restaurant, overlooking the active Kilauea caldera, with a wander through the interpretive museum in the park where you can learn about the fascinating geology of this area. 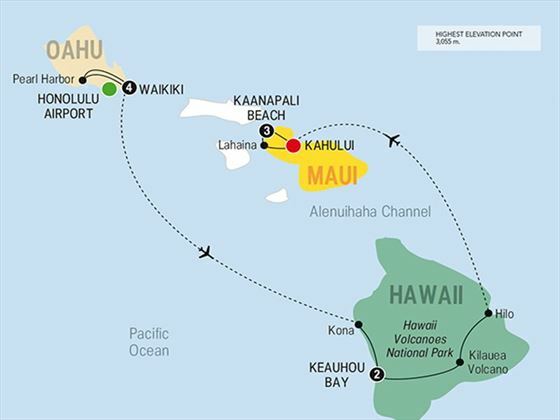 From here, travel west to the airport at Hilo where you’ll board your short flight to Maui. Then the evening is yours to spend at leisure after checking in at your hotel. Travel along the coast to the Maui Ocean Center, home to the world's largest collection of live Pacific corals, green sea turtles, sharks and thousands of beautiful tropical fish. Here you'll be be introduced to the conservation naturalists who will share their underwater world with you. Afterwards, visit a local farm to learn about the agriculture of this island before indulging in a special lunch where you’ll dine on a selection of Hawaiian delicacies using local ingredients. This evening you have free time to enjoy the sunset from your resorts or venture out to try one of the local restaurants. 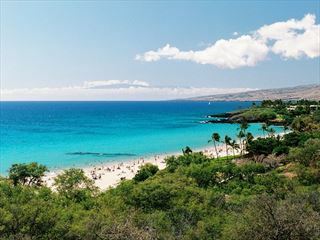 Spend a full day at leisure, making the most of Maui’s attractions, beaches and charming villages. 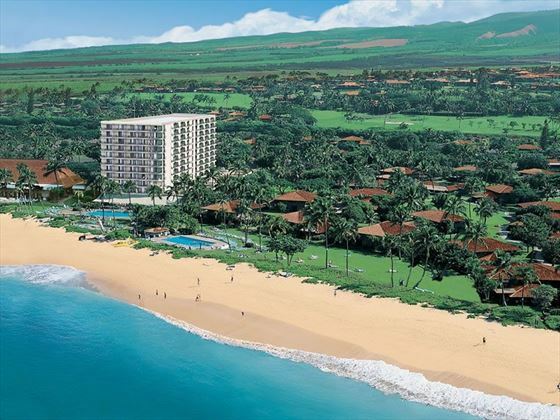 Perhaps explore the old whaling village of Lahaina or play some golf at the championship course overlooking the sea, or embark on a whale watching or submarine tour. Join your travelling companions this evening for a farewell dinner - a lively Hawaiian Luau featuring Hawaiian buffet and tropical cocktails, followed by songs and dances of Hawaii and the South Pacific. Today marks the end of your trip – make your way to the airport for your departing flight home.